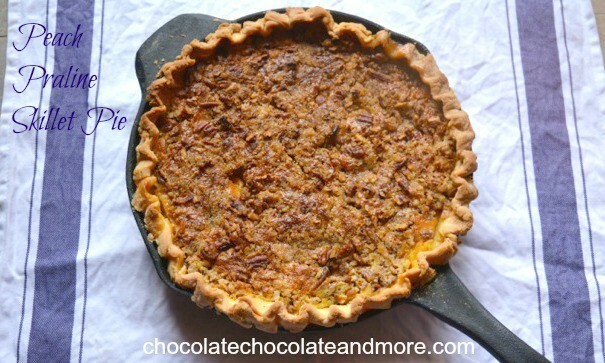 Peach Praline Skillet Pie - Chocolate Chocolate and More! Creamy custard, sweet peaches and crunchy praline combine for a taste of heaven. Baking in a cast iron skillet gives Peach Praline Skillet Pie an extra flaky crust. When I was a kid growing up in Delaware, we lived in a neighborhood with no fences. Kids cut through yards to get to their friends’ houses or the neighborhood pool just a little faster. We had a small peach tree in our back yard that produced a ton of peaches every year. Joan hated it because it attracted bees and many of the peaches fell to the ground and rotted before we could pick them all. I love fresh peaches so I have fond memories of eating sweet, juicy peaches on hot summer days. We used to freeze some of the peaches so we’d have that fresh-picked flavor all winter long. I used the frozen peaches for cobblers, pies and as a topping for my oatmeal during those cold winter months. 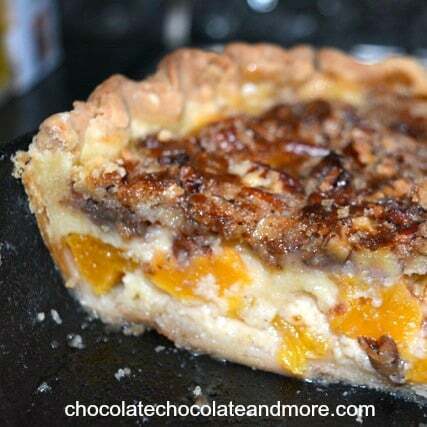 I found a recipe for the Delaware state pie, peach custard, some time ago. The recipe is great but my custard always came out runny and there was too much custard for even a deep dish pie so I wanted to fix that. 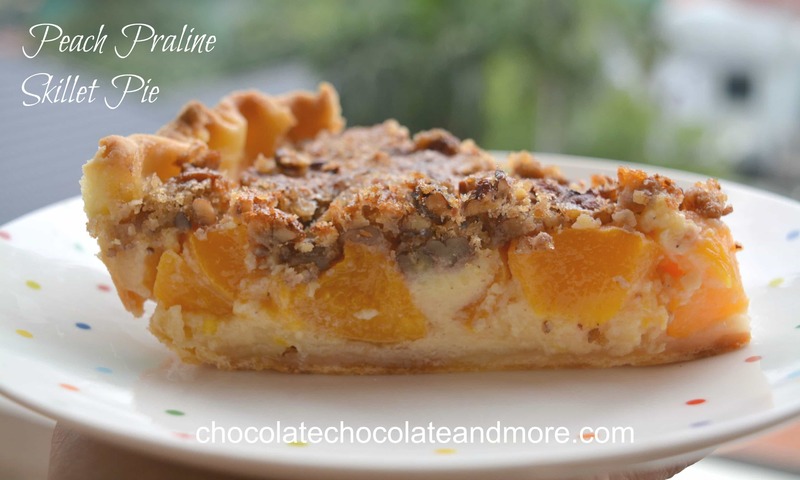 Peach Praline Skillet Pie is a Texas twist on my Delaware peach custard pie. So why use a cast iron skillet to make pie? A few years ago, a friend of mine mentioned she was getting rid of her teflon cookware because teflon fumes can kill birds. I thought, if teflon fumes can kill birds, maybe I should limit my use of teflon cookware. When I did a little investigating I found that PFOA, a chemical is used to make teflon, causes cancer in animals and is found in the blood of 95% of Americans. You can read about the lawyer who cracked open the scandal of PFA in this New York Times article. I’m not one to panic but I thought it best for my kids to phase out my teflon pans. It wasn’t easy to find frying pans that were non-stick and non-teflon. While I love my stainless steel pots, stainless doesn’t work so well for frying pans (in my opinion). I did find some ceramic non-stick skillets that work well and I bought a cast iron griddle. I was amazed at how versatile cast iron is and how evenly it cooks. A few simple rules keep my griddle non-stick. Usually a quick rinse is all I need to clean my cast iron. You’re not supposed to use soap to clean cast iron, but sometimes your pan needs a good scrub. Just dry it, lightly coat with cooking oil and put on the stove until it’s hot. Then let it cool and it’s good to go again. My griddle works so well it’s nearly always on my stove and I bought several skillets and a cast iron muffin pan to go with my griddle. The muffin pan makes small muffins but the outsides are crisp with tender insides. When I was packing for Cambodia, I was limited to 80 pounds of checked luggage and a good chunk of that was educational supplies so I had tough decisions to make. Cast iron weighs a LOT so my griddle stayed home. I was hoping I could find cast iron in the markets but no such luck even in the specialty stores. I so missed cooking with cast iron that when I was home for my sister’s funeral, I bought a cast iron skillet to bring back with me. I opted for a skillet because I knew I’d make at least one pie for Thanksgiving and the deeper sides of a skillet make it useful for baking. 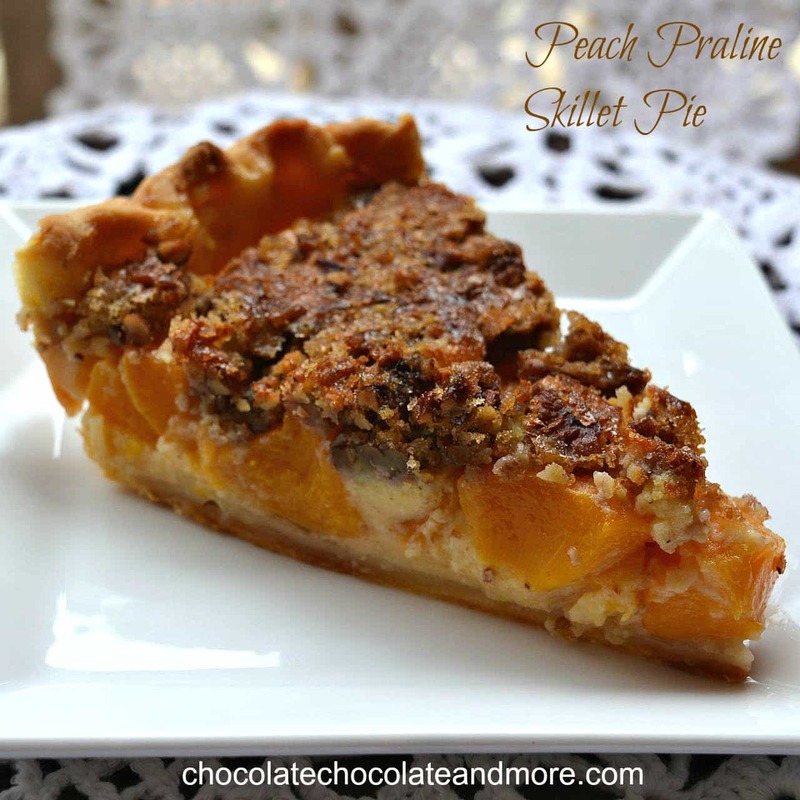 When Maximus from Old Time Pottery contacted me about doing a post for them, I immediately thought of making Peach Praline Skillet Pie. Sadly, there are no Old Time Pottery stores in Texas so I’m limited to ordering online but for those of you lucky enough to shop there, they have cast iron skillets at reasonable prices. The also have other kitchen gadgets and some wonderful serving pieces in their dining section. I was hoping that the cast iron would give pie crust the same crunch it gives muffins and I was right. The crust was very flaky and the pie didn’t stick at all to the pan. To make the pie crust, mix flour and salt together. Cut in the cold butter with a pastry blender, Add milk and work into a ball. Roll out to fit your skillet or pie pan. To make the filling, whisk together all filling ingredients except the peaches. Add sliced peaches to the mixture and pour into prepared crust. Mix together the topping ingredients. Sprinkle on top of pie and bake at 375°F for 45-50 minutes. You can use canned peaches in light syrup. Drain the syrup and cut into bite sides pieces, 3 cups of canned peaches is about 1 large (29 ounce) can plus 2 more peach halves. If/when you’re ever looking for any high-quality cast iron products, make a believe to your local outdoor sport/camping supply retail outlet. Here in Texas that would probably be Sport Authority or Academy Sports, but I’m sure other areas of the country have their own such retail establishments. OK, the following advice comes with a bit of “authority” to it, since I am a tried professional chef who has also worked at Williams-Sonoma AND Sur La Table & know their merchandise well. Once you get to a outdoor sports/camping supply store, go to the “Outdoor Living” area or the “Camping” area, & you’ll find a mind-numbing selection of cast iron cooking products from which to choose. They carry the “gold standard” of American cast iron products: “Lodge Logic.” (Do an online search for “Lodge Logic” to learn it’s history, reputation & the fact that they began back in the 1920’s strictly as an outdoor camping supplier of cookware. Plus, the prices there are MUCH cheaper than W-S or SLT carry and with a wider variety of cast iron products. Happy cooking! Camping stores are a great place to get cast iron cookware and my frying pans, griddle and muffin tin are Lodge Logic. Target also carries a limited supply of their products. They are the best. I need to get a dutch oven some time. The Old Time Pottery prices are competitive with Target and the camping stores I’ve been to. This recipe looks so good. I can’t wait to give it a try. I’m not a big fan of nutmeg so I might try cinnamon instead. The nutmeg is pretty subtle but I bet cinnamon would work well. Let me know how it tastes! This is such a great idea for a pie! I totally need to try one in a cast iron pan – genius! Thanks Dorothy. Even without the cast iron skillet, it’s yummy!